The article was written at the request of a curator in the British Museum when I pointed out errors in a display of ancient games a few years ago. There have been some new developments, but they do not affect the thrust of the article. It may be used, with acknowledgement, in www pages and other Internet sites but not in paper print, and of course I do retain copyright (London 1995) and other associated rights. Pinyin transliteration is used, except in quotations, and all translations are my own. The Chinese game of weiqi, better known to us by its Japanese name go, has been done a great disservice by the chess historian H.J.R. Murray. In Murray 1952:35-36 he concludes his brief discussion of games in ancient China thus: "The oldest and best of the native Chinese games, wei-k'i, is not older than AD 1000." This is prefaced by other outrageous remarks: "... Chinese historians have always tended to exaggerate the age of their inventions and in particular the age of their games. 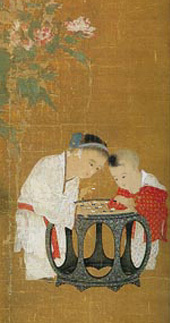 Modern scholarship holds that the only Chinese board-games before the Christian era were simple games of the merels type, i.e. games of alinement. The yih mentioned by Confucius (551-479 BC) and Mencius (372-289 BC) was the smaller merels." Moreover, what was to Murray "modern scholarship", so far as I can see, totally contradicts his assertion. Limiting ourselves, in deference to his suspicions, to non-Chinese scholars, we find Dr Ogawa Takuji, for example, in a very important article (Ogawa 1933:79) stating: "It is correct to interpret yi as weiqi. There can be no doubt that the reference to yi in Mencius is used only in respect of weiqi." In Eberhard 1942:104-105, Professor Wolfram Eberhard more cautiously said thet yi "is normally equated to Wei-ch'i" but added unequivocally: "The term Wei-ch'i occurs as early as Han times," before the start of the Christian era. And Karl Himly, whom Murray approvingly quotes elsewhere in his piece, says the game, the same as the Japanese go, was "first mentioned in Tso Chuan, Analects [of Confucius] and Mencius" (Himly 1896:136-137). As it happens, we do not need to rely on scholarly reputations to show that go is much older than Murray claims. We also have archaeological evidence. From China this includes a 17x17 stone board dated prior to 200 AD found in Wangdu County in 1954 and now in Beijing Historical Museum (Watanabe Y. 1977:119) and an exquisite picture on silk of a Tang lady playing go, also on a 17x17 board, excavated in 1974 at Torfan and dated around 750 AD (Watanabe Y. 1977:119-120; reproduced in colour in Go World 29, Autumn 1982). These discoveries post-date Murray, but full sets of go boards and stones have lain in the imperial repository, the Shosoin, in Nara, Japan, since the mid-8th century (see e.g. Masukawa 1987:1-8). There is also a mass of background evidence - anecdotes, fairy stories, biographies, mathematical manuals, etc. - that refer to go and show it was well established in China, Japan and Korea well before 1000 AD. I therefore propose to survey the evidence for the antiquity of go, although as there is so much it is possible here to attempt only a tour d'horizon, and even then I shall have to limit myself largely to China in the period before about 250 AD. But, first, a note on terms: the modern name for go in China is weiqi (pronounced way-chee), which means the " surrounding game." In old texts, however, the ancient term yi is also used. Both have often been rendered "chess" in English, but proper Chinese chess is xiangqi. It is also useful to recall that modern go is played on boards of 19x19 lines (=361 points) with 181 black and 180 white "stones" (pieces). In ancient times 17x17 and even smaller boards were used with correspondingly fewer stones. Today only Tibetan go still uses 17x17 boards, with slightly different rules of play from go elsewhere (Cheng 1988; Fairbairn 1990; Watanabe H. 1983:54-61). In China, Japan and Korea the only major differences in the rules have been in the initial set-up, handicaps, and the method of counting up a finished game. Recall also that liubo or bo refers to a race game (proto-backgammon?). Several other games are referred to in ancient texts, but I shall avoid referring to them. However, since many western games writers have, to their great detriment, ignored oriental research, I urge them to read, for example: Ogawa 1932, especially on wuzi (five stones: generally regarded as a precursor of gomoku but possibly a derivative of backgammon) and tanqi, a precursor of hasami-shogi; Kotaka 1943; Masukawa 1983; and Yang Y. 1946. For liubo see also Watanabe T. 1982 and Koizumi 1991. Most Chinese writings on go quote the legend: "Yao invented go in order to instruct his son Dan Zhu." Since Yao was a semi-mythical emperor of the 23rd century BC, this is usually rendered in English as: "Go is 4,000 years old." This is but one legend, though the orthodox one. It is usually attributed to the scholar Zhang Hua, for the remark did appear in his "Bo Wu Zhi" [Record of the Investigation of Things], written about 270-290 AD (the ancient Chinese texts quoted here appear in many anthologies; for go the best are Shen [undated] and Liu 1985; on Zhang Hua and go see also Shirakawa 1993). However, he went on to add, with dry mockery: "Others say [Emperor] Shun regarded his son Shang Jun as stupid and invented go to instruct him." It is necessary to realise that, as many anecdotes show (e.g. Du 1987:11-19; Li 1980a; Watanabe Y. 1977:93-133), go had suddenly become enormously popular in Zhang's time, but was frowned upon by Confucian moralists - for Confucius appeared to regard it as only one step up from gluttony and idleness. The ascription of go to Yao, in fact based on the " Shi Ben" [Origins of History], a book of the Warring States period (475-221 BC), was designed to counter this, since the sage kings Yao and Shun found favour with Confucius. Zhang Hua's understated observation of the manners of his time should not be taken as credulity. Indeed, the Chinese themselves have a long tradition of dismissing the legend out of hand, though using sometimes surprising arguments. For example, the preface to the celebrated " Xuanxuan Qijing" [Mysterious and Marvellous Go Manual] of 1347 says that go is the wrong thing to make a foolish son wise. Others of course chose to believe it. The Regional Inspector Tao Kan (259-334) had go and backgammon boards thrown into the Yangzi River because go was "for foolish sons" and because backgammon was supposedly invented by the evil tyrant Zhou around the 11th century BC (Watanabe Y. 1977:144). Divination in China seems to have been associated first with agriculture. Certainly the Shang (16th-11th century BC) used cracks in animal bones and turtle shells to predict harvests and the weather. Interestingly, too, divination was associated with the legendary Yellow River Diagram and the Luo Record. These were supposedly revealed to the Great Ancestor Fu Xi on the back of a dragon-horse and a turtle that rose out of the Yellow and Luo Rivers respectively. They are just magic squares, but the Chinese have always depicted them in the same way as go diagrams. The Shang were displaced by the Zhou, who shifted the emphasis of the oracles to predicting the influences of the heavenly bodies. This was the period when the enduring yin-yang theory took shape. Their view of the cosmos was widely admired and quoted even by later go writers. For example, in the "Yi Zhi" [The Essence of Go] the famous historian Ban Gu (32-92 AD) said: " The board must be square and represents the laws of the earth. The lines must be straight like the divine virtues. There are black and white stones, divided like yin and yang. Their arrangement on the board is like a model of the heavens." A more likely source for the origin of go lies in the way Zhou divination changed. Originally the heavens were asked what Fate had in store for all sorts of ventures, but Man being what he is, these ventures became increasingly warlike, so that typical oracle sessions (as recorded on the bones) would be: "A sign was given; this spring the king, in attacking the X clan, will be able to call out 5,000 men to wage war" or "On the 8th day, we will slay 2,656 men in battle" (Watanabe Y. 1977:64-65). Assuming the existence of a divining board, perhaps based on the magic-square diagrams, it is then easy to imagine go evolving from sessions around the board with black and white pieces, conceivably placed in shapes resembling cracks in shells or bones, with priests arguing over possible interpretations. Or perhaps military men: there is a reference in Chapter 1 of Sun Zi's "Bing Fa" [Art of War, c. 5th century BC] to counting " factors" in the ancestral temple before an engagement. See Lau 1965:331-332 and Sawyer 1993:437. There is also the use of lodestones and magnetic divining boards to consider - see Needham 1962. 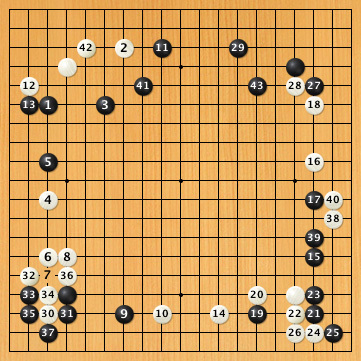 Though still speculative, this version of go history seems to be the most favoured at the moment, and if true suggests a date for its creation perhaps somewhere between the 10th and 4th centuries BC. Whatever its origin, go became a much-used metaphor for war later. The "Qijing Shisan Pian" just quoted, for example, is modelled on Sun Zi's Art of War, not just in the number of chapters but in its phraseology. Mao Zedong was also fond of using the analogy (Boorman 1969). Nonetheless, except insofar as the speculation above is justified, go seems never to have had strong associations with warfare, unlike chess. Even its terminology is elusive - the many ancient terms that survive refer mainly to hand movements (block, push, throw, etc.). The "Zuo Zhuan" text (Duke Xiang, Year 25) reads: "Duke Xian of Wei ... ... went to speak with Ning Xi. Ning Xi promised [to collaborate with him]. When the Grand Uncle Wen Zi heard about this, he said: "Alas! ... Ning is now dealing with his ruler with less care than if he were playing go. How can he escape disaster? If a go player establishes his groups without making them safe, he will not defeat his opponent. How much worse if he establishes a ruler without making him safe." Confucius's reference (Analects, Book XVII, 22) is unflattering: "It is difficult for a man who always has a full stomach to put his mind to some use. Are there not players of [liu]bo and go? Even playing these games is better than being idle." "Now the art of go is but a minor art. Yet if one does not apply one's mind to it and bend one's will, one cannot master it. Go player Qiu is the best player in the land. Suppose he teaches two people to play, and one applies his mind and bends his will and listens to what Qiu has to say. The other, however, listens to him but his mind is on a swan he imagines is approaching and he wants to take up his bow and arrows and shoot it. Although he is studying with the first player, he will not be as good. Is this because he is not as intelligent? I say no." All these classical references are to yi. Admittedly none of them tells us what the game is, and we have to wait until Han times (206 BC - 220 AD) for detailed descriptions that confirm yi is go. But the weight of tradition cannot be ignored, for there is a continuum of references to yi between the Confucian era and Han times. Interestingly they often imply that it is a game of skill, and as will be shown below a rather high level had already been reached by Han times, and then beyond, although in the Han the term weiqi emerged. Yin Xi, for example, in the "Guan Yin Zi" [Book of Master Yin] of the late Zhou period (4th-3rd century BC) says: "Take the accomplishments of archery, chariot-driving, playing the zither, and go: in none of these is it possible to stop learning." Liu An's "Huai Nan Zi" [Book of the Prince of Huai Nan] (c. 140 BC) also says: "To play but one game of go [qi] is insufficient to know wisdom." As to why yi was first used whereas weiqi became usual later, the answer is probably found in the book "Fang Yan" [Dialects] by the Han scholar Yang Xiong (53 BC - 18 AD) which says, "Yi refers to weiqi. East of the Hangu Pass in the states of Qi and Lu everyone says yi." Lu, now Shandong Province, was the home of both Confucius and Mencius and so yi was naturally the term used by them. Another early statement of the meaning of yi is in the dictionary "Shuo Wen Jie Zi" [Analytical Dictionary of Characters] by the Later Han scholar Xu Shen, written in the 1st century AD, where he says: "Yi is the surrounding board game." Xu also tells us here, by the way, that bo is a board game using six sticks as dice, and twelve men. As these and other texts imply, weiqi had become the most familiar term in Han times and yi had to be explained to readers of those times. One obvious reason was the shift in the geographical focus of power and thus the ascendancy of another dialect. There is, however, also a theory that yi may have referred to go on 17x17 boards and weiqi to the 19x19 version, the two versions co-existing rather than one evolving from the other (Yasunaga 1977). The survival of Tibetan go (17x17) is seen as evidence for this. The situation is very confusing. The 17x17 board discovered at Wangdu and referred to above dates from the Later Han, and there are references to 17x17 boards. The most celebrated is by Handan Chun of the following Wei period (220-265) in the "Yi Jing" [Manual of Accomplishments]: "The go board has 17 lines along its length and breadth, making 289 points in all. The black and white stones each number 150." Against this, however, the earliest surviving game record appears to be the game, in "Wang You Qing Le Ji", between the Wu prince Sun Ce (175-200) and his general Lü Fan. It is on a 19x19 board (see Figure 2 [available from ftp://ftp-igs.joyjoy.net/Go/games/ancient.sgf.Z in Smart-Go format]). Until the discovery of the Wangdu board and Tibetan go, it was long assumed by modern players that the Sun-Lü game was a forgery (or Handan Chun was wrong). However, the whole question of its authenticity has been reconsidered recently in Li 1980b. He establishes that the conditions for it to have been true did probably exist, that is 19x19 boards were being used. He suggests too that this board, whether new or evolved, contributed to the upsurge in popularity of go. There is yet another layer of complication, however, in that the boards in the Shosoin (of a design known also in ancient Korea and China) have 19x19 lines but only 300 stones and no space on the edge, making it difficult to play stones on the edge line (Masukawa 1987:4). It has been suggested therefore that only 17x17 lines were actually used. This theory has been undercut by the discovery of the Torfan picture which shows a 17x17 board with no edge space but stones on the edge line! To confuse things even more, the date of this picture is rather late (c. 750) if it is assumed that 19x19 boards supplanted 17x17 ones (though Tibetan go suggests not entirely), but a board of the same full-out style, only with 19x19 lines, has been excavated from Anyang in Henan and is dated 557-618 (now in Henan Province Museum). Resolving this confusion will surely be the most profitable area for future research. "When starting, the best strategy is to spread the pieces far apart and stretch them out, to encircle and attack the opponent, and thus win by having the most points vacant. The next best strategy emphasises cutting off the enemy to seek advantage. In that case the outcome is uncertain and calculation is necessary to decide the issue. The worst strategy is to defend the borders and corners, hastily building eyes so as to protect oneself in a small area." As any good go player will verify, this implies a sophisticated knowledge of the game. This piece is also valuable in confirming (as the games in "Wang You Qing Le Ji" also show) that the final count-up was done as it is in Japan today, counting only vacant points (territory). The modern Chinese method is to count both stones and territory. For a discussion of the date of the changeover (Yuan-Ming era? ), see Yang L. 1960. And make their way into the centre. But will overflow and the flood reach far and wide. This again shows a deep insight into go as a game of skill, at a time when other cultures were barely above the level of games of chance. What is more, since then go has had almost 2,000 years to flourish further. In that time it has been woven into the fabric of Asia's history at every level, enjoyed by emperors, immortals, scholars and common men. It is sad that its history is so little known in the west.